This engaging drama relives the heart warming story of Dame Barbara Windsor, the Cockney girl with a dazzling smile and talent to match. Barbara's story takes us on a journey spanning 50 years from 1943-1993 - her lonely childhood and WWII evacuation as a child, her humble beginnings as a bus conductor's daughter and the complicated relationship with her father John Deeks. Barbara's complex past with her father may well have shaped the choice of men in her life - including her first husband Ronnie Knight, who during the marriage was one of Britain's most wanted men. But Babs ever the consummate professional, never let her fans down whatever her personal anguish. Barbara's first stage debut came at age 12 and she's remained in the spotlight ever since. Her infectious personality grabbed the hearts of the nation and captured the eye of the ground breaking theater director Joan Littlewood. 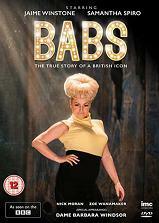 Working with Joan on stage and and screen saw Babs nominated for a Tony and a BAFTA. Babs later secured her place as the blonde bombshell in the Carry On films and thereafter history was made. A finely woven script, the story unwinds, full of heart and heartbreak - with a touch of sauciness thrown in for good measure. NOTE: This DVD is in PAL format which is not compatible with NTSC format DVD players. Most DVD players in the U.S. are NTSC only. Please check your DVD player's format before ordering.